This was a timely read in time for my Christmas entry. What more appropriate than to re-examine whether or not there is a case to argue for Christ's existence, his claims of Godly identity and his resurrection from the dead? I set my cards out here; I have been a Christian for many years but when my 16 year old son began questioning the basic tenets of faith, it seemed like a very good idea to reinvestigate a logical rather than a theological approach to Jesus Christ. The background to the book is interesting, and was certain to appeal to my son. 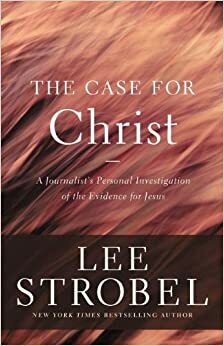 Lee Strobel was a non-believer who has an academic background. He is a journalist and has qualifications in law too. This intelligent and enquiring mind was exactly what I needed to read. Strobel became interested in the claims of Chistianity after his wife became a Christian and her new faith had a positive influence in their lives. He took the experience of his work, rigorous investigation with an onus on burden of proof, and applied it to Christ. The book follows three main strands of faith: the credibility of the gospels, the identity of Christ and the plausibility of the resurrection. He cross examines experts and communicates logical objection to key areas. The book is easy to read and each chapter is introduced with a secular example of what he is trying to prove, whether that is the significance of an eyewitness or the necessity and reliability of circumstantial evidence in securing a conviction. These anecdotes are interesting and relevant, and work very well as an introduction to an equivalent point based on evidence for Christ. Strobel did his own painstaking research from books, testimonies and papers over a period of more than two years. Since then he has secured interviews with leading bible experts and corroborated his findings. This book is an account of his discussions with those experts. In the need to be scrupulouly fair however, I acknowledge that though he cites secular and atheistic writers, he doesn't interview them for a full counter viewpoint. The counter is considered, but not thoroughly investigated. The whole text is fair, reasoned and logical. It is persuasive without seeking to persuade. It is the honest rendition of an atheist who felt compelled by evidence to believe what he had always dismissed as legend. It is a book worth reading. Everyone should consider who Christ is. It was C.S.Lewis who first wrote that either "this man was, and is, the Son of God: or a madman or something worse." Deciding for ourselves is important. It could change your life. Thanks, Karen - helpful review.